When we booked our trip to Venice, I thought 'Perfect! I'll have the cutest outfit photos with all those bridges around!' Within approximately a millisecond of arriving, I realised things were not as simple as I thought. Every bridge I encountered- and there really are a lot- was crammed with people and flooded with direct, very hot sunlight. Things were not looking good! Then we had lunch on the north side of the main island, and as it was very quiet in that area, we had a look around for shady bridges. Rejoice! We found the perfect one! 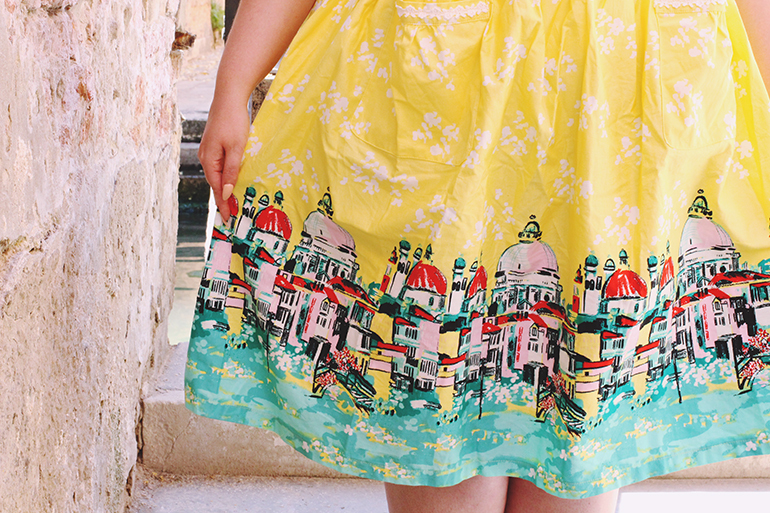 I was very excited to crack out my Venice-themed Lindy Bop skirt. 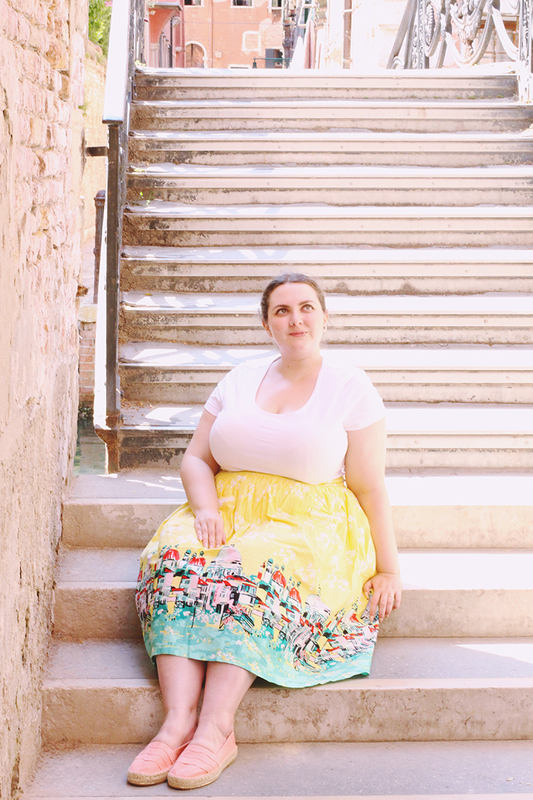 After the fun of wearing my Alpine skirt in Austria at Christmas, I decided I was very much into this whole location-themed outfit thing and checked out the other cities available. 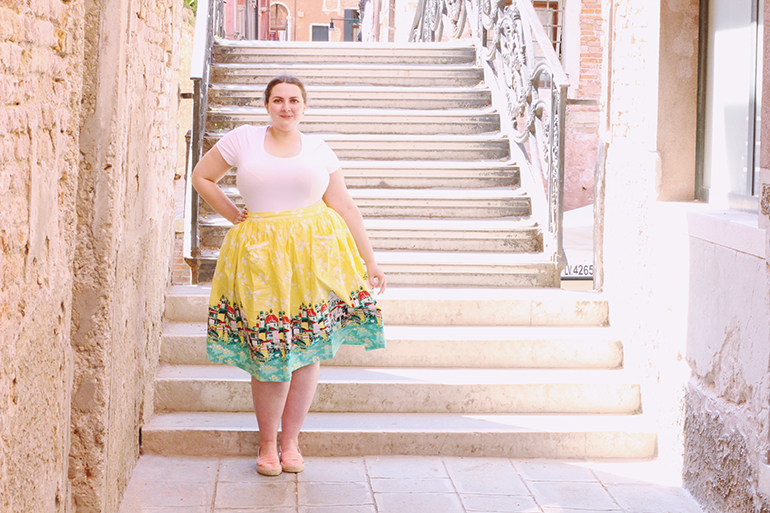 Knowing I was booking a trip to Venice, I was glad to see this skirt and bought it there and then, putting it carefully to one side for the five months before I packed for Italy. I'm nothing if not prepared! Something I didn't consider was the heat. 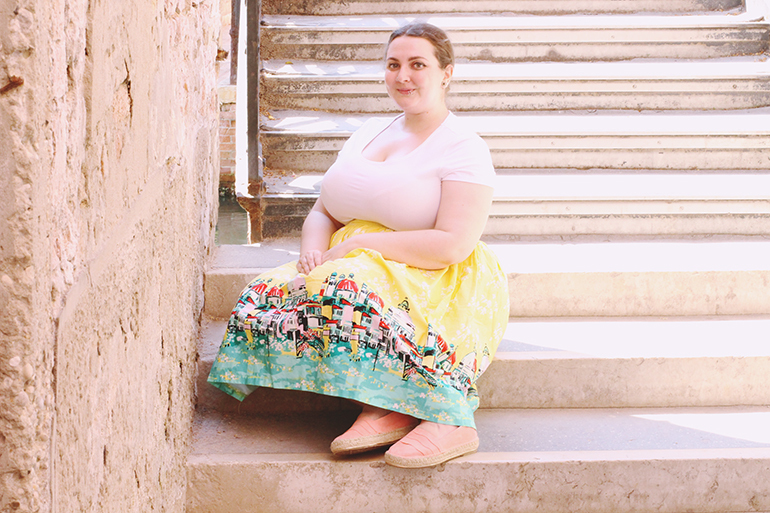 The skirt is made of quite a thick cotton so it was fairly heavy in the heat but since it's flared, it didn't feel oppressive. 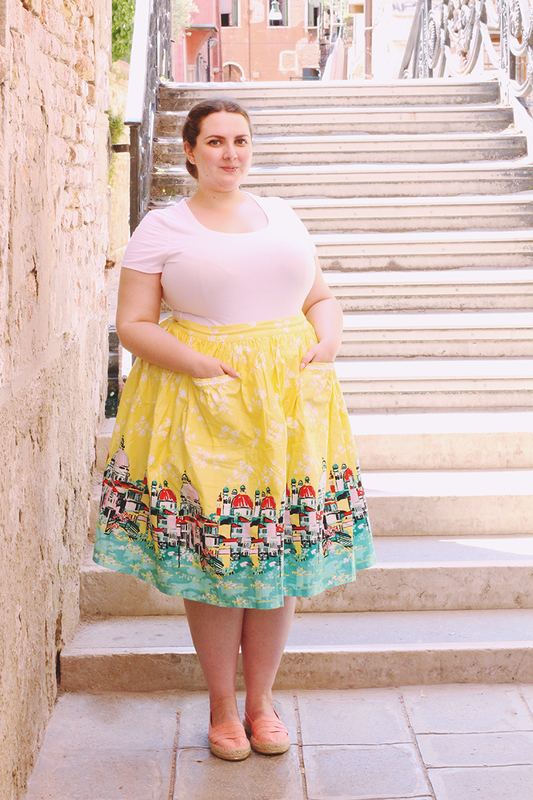 Pairing the skirt with a plain white t-shirt also stopped me overheating. 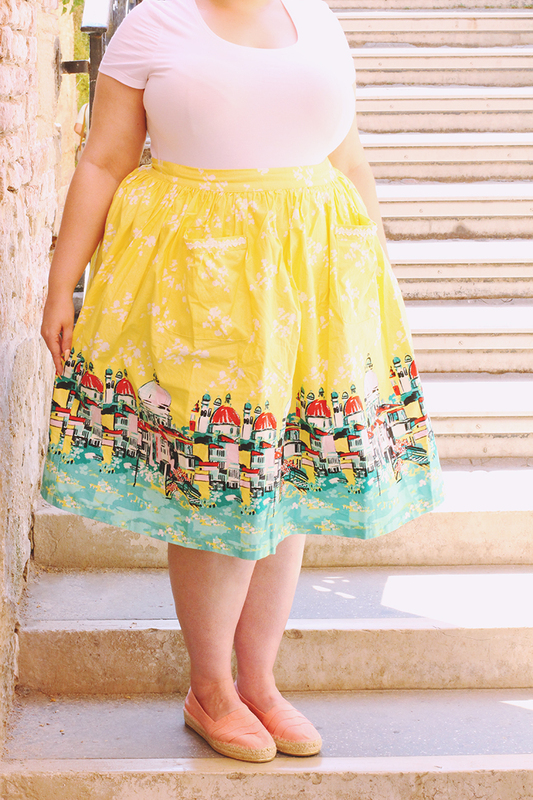 As you can see, the skirt has pockets which is always a huge plus, and the colour was just perfect for Venice. For some reason, everyone there wears yellow so I felt very much part of the cool crowd! Of course, the border is just adorable with illustrations of the canal-side architecture. My shoes are part of the Ellie Goulding collection at Deichmann. 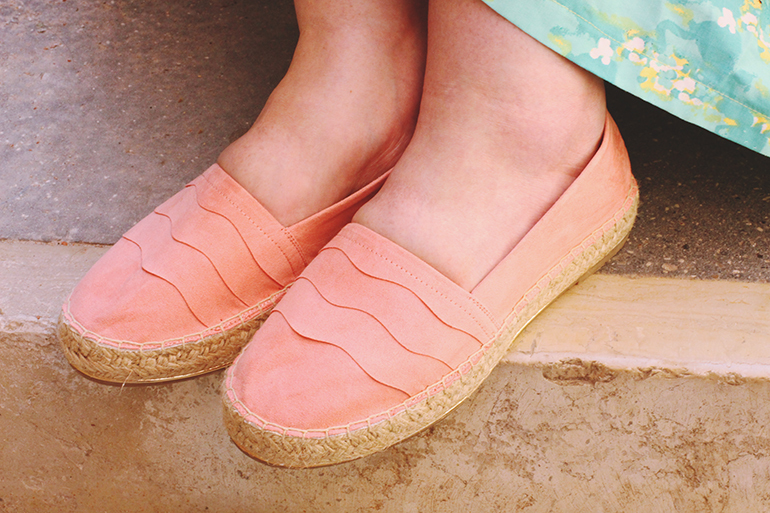 Having never worn espadrilles before, I wasn't really sure what to expect but they were so comfortable! I get really tired feet if I wear shoes with a thin sole so the chunky bottom was perfect. The only problem I had was my feet swelling in the heat and making the tops feel very tight. Since the upper material is fairly stiff, there wasn't much wiggle room there for my poor feet, so I'd definitely recommend sizing up to allow for this. Still, they look cute and the coral-peach shade perfectly matches the Venetian architecture so it was a worthy sacrifice! Affiliate links have been used in this post. Shoes provided by Deichmann but all opinions my own. That is an amazing skirt! We absolutely adore this outfit...and yes thanks to you we now have a wish list on Lindy Bop!! We love the 50's style dresses and could go crazy buying them all. The city dresses are so cute and we've spotted a few diner and car themed ones too!!! So awesome! Thank you for introducing them to us! :) Hope you had a wonderful time in Venice! 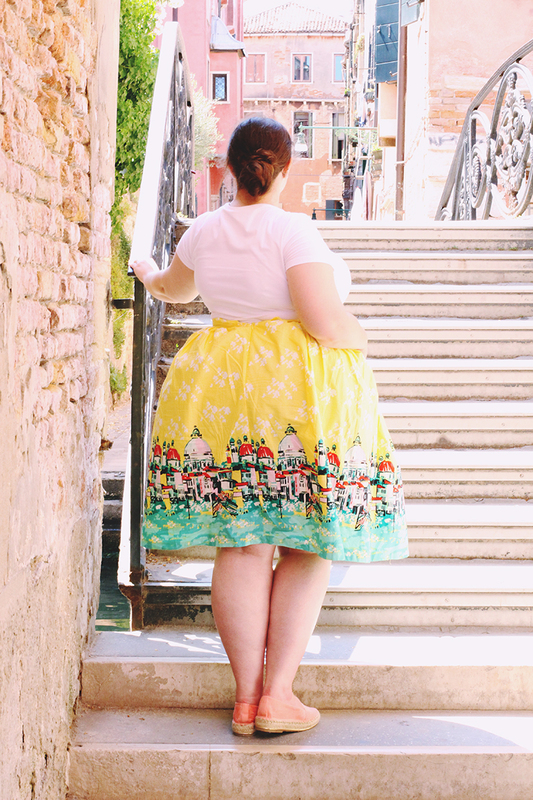 Love this skirt, and the idea of themed dressing (hey, maybe I'm a bit tacky too!) Beautiful photos. This is SUCH a cute outfit, and a fantastic location for the photoshoot!